Many buildings in the City were converted to accommodate wounded soldiers during the First World War. The Royal Pavilion, the Corn Exchange and the Dome were all transformed into Indian Military hospitals. The Corn Exchange ceased to be a corn market in August 1914. 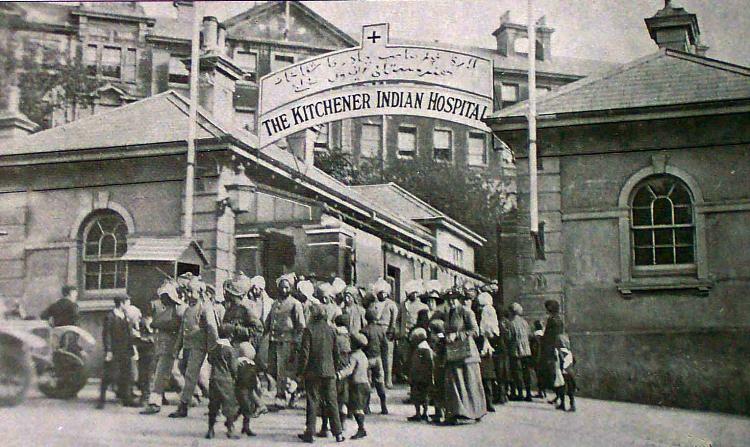 The Work House in Elm Grove, renamed Kitchener General Indian Hospital (photo above), now Brighton General Hospital, was converted into a 2000 bed Indian Military training hospital. York Place School was converted into a hospital specially adapted for the Indian wounded soldiers. – 38 Adelaide Crescent Hove: 20 beds. 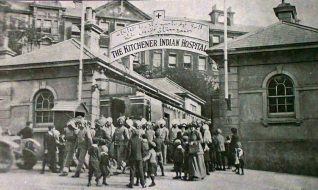 Over 12,000 Indian wounded soldiers were admitted to the Brighton Hospitals. If soldiers were wounded in battle and could not get back to their trench or unit on their own, they had to wait until nightfall before they could be rescued and brought out by stretcher bearers or colleagues. They were then taken to one of six hospital trains which could carry up to 400 patients at a time, each train having the facilities to carry out treatment and operations on board. These trains transported the injured soldiers to the ports of Boulogne or Le Havre where they boarded hospital ships to the south coast of England from where they went by train to Brighton Rail Station. The Brighton Gazette on Monday 14th December 1914 reported the first arrival at Brighton Railway Station of wounded Indian soldiers headed for the Pavilion and York Place Hospitals. A week later the Gazette again reported the arrival of wounded Indian soldiers and it seems that the whole town was ready to receive them. The train was met by the Chief Constable, the Mayor, the Red Cross and St. John’s Ambulance. 345 patients arrived, 160 of whom were stretcher cases. A number were carried by motor ambulance and others were walking wounded. Crowds had gathered in the rain along the route from Brighton Railway Station to the Royal Pavilion, and they stood and cheered these brave Indian soldiers straight from the front line who had come to England’s aid in time of need. Now the people of Brighton could show their affectionate gratitude to these ‘Sons of the East’. Reference to First World War military hospitals. As part of my research into the 90th anniversary of St John Ambulance, I have written a book which includes a lot of information about this topic, including photos. Our current exhibition in the Community section of Brighton Museum also has information. I am trying to get information about William Quigly who was working at York Place Military Hospital possibly in charge of the Dispensery Section. I have a photo of him with three lady staff members. He is not in uniform but I have found him on the 1891 Census as Sargeant in the Army Hospital Corps, Aldershot. If you can point me in the right direction I should be most grateful. Your web site is great. My great grandfather was injured in 1917 with a leg wound. He was also suffering from shell shock. He came from Brighton and I wonder if there are any records detailing him. His name was Henry Havelock Cornell. Can anyone tell me if there were any German PoWs treated in Brighton during the First World War. What about World War Two military wounded? There were antiaircraft emplacements all along the Brighton seafront. Some of these were bombed. I would like to know, please, where these gunners would have been taken to hospital for treatment. If you can give me the names of hospitals near Brighton who treated wounded, I will write to see if they have records dating back to February 1944. Thanks. Don’t forget the former hospital in Preston Barracks. That was built in 1793 but only became a hosptal in the 1820s. It saw cholera cases in 1832, and repatriated injured from the Crimea. If you consider Preston as Brighton, that must have been the town’s oldest military hospital. I understand my 2 x great grandfather, George H B Coats, ran the Brighton Pavilion Military Hospital and would love to know anything more about him, his family, his military history and his time in Brighton. Please do get in touch if you have such information. From what I can trace, there is the Chattri, which was used as a ghat for the Indian soldiers who died in the Pavilion under special dispensation by the Hindu and Sikh religious leaders as not being near a river or water, whilst some ashes were taken back to India. This can be viewed on the Downs at Patcham and I believe you can get a key from the hostel in the park opposite Patcham village to visit the enclosure. There is also the Indian Gate at the south side of the Pavilion gardens, which was presented to the town by grateful Indian government. I think also there must be some information at the Pavilion and in the local studies department at the Keep. With reference to Bert Williams’ statement that Brighton Hove & Sussex VI Form College on Dyke Road was converted into a 520-bed Military hospital to receive Dominion troops in February 1915: The initial troops received were from British regiments and the first intake took place on 3 September 1914 (see The Times). Will be checking on ‘Dominion’ but all the lads in later arrivals seemed to be from the UK. My grandfather, Henry Augustus Swarbrick was evacuated unconscious, to Brighton just before the armistice in 1918. Are there any records that document where wounded New Zealand officers were accommodated? Our research to date points towards the present Brighton and Hove sixth form college. It would be great to know where he was cared for. Does anyone have any information on ex-King Manuel of Portugal’s involvement with a military hospital in Brighton. I have a quote which suggests that shortly after the beginning of the First World War Manuel established a hospital for wounded soldiers in Brighton. Thanks, Paul. A commemoration event to those in our parish who lost their lives in WW1 is being held in August. One of these men was Baldwin Andrew he was in the Royal Army medical core and died in Kitcheners Hospital Brighton on 4th March 1918. He is buried in our local church yard. Would you know if he died of his wounds or from some disease perhaps. Look forward to any info you can pass on. Thank you Andy, only just spotted your replies after all this time! My grandfather was fascinated to hear about this. I also understand he had something to do with the playing of a game called Stoolball at the Pavilion! I am hoping to visit the WWI exhibition currently on at the Pavilion in the next few months. Can anyone tell me whether non-Indian patients were also cared for at the hospital? On my great-uncle’s death certificate his place of death is listed as Kitchener Hospital, Brighton, October 1918. He was not Indian. Hi Diane, The Kitchener Hospital was used for British troops, but only later in the war. As your great uncle died there in 1918, this is consistent with the facts. Regards, Andy. Thanks for clearing up that the hospital was used for non Indian troops later in the war. My grandfather’s brother who was with the ANZACs was sent there in July 1918 following serious leg injuries, he had both his legs amputated. My great uncle – Bazil Victor Morgan – was in the Kitchener Hospital in 1917. He was admitted on 23 April 1917 from France and discharged on 12th October 1917. He was with the 6th Welsh Regiment in the Machine Gun Corp. He would have been 27/28 years old. He was born in 1890 in Pontypridd, Glamorgan, Wales. Is it possible to get any medical records? I don’t suppose anyone would remember him, have photos, know anything about what the regiment did in France? Any information at all. Thanks a lot Jane Brown. Hello, I’m education and research officer for Stoolball England. I’m interested in Joanna Scott’s comment of 29-08-14 about her Grandfather and stoolball played at the Pavilion. I hope you’ll pick this message up Joanna as I’m putting a project together for Stoolball England about stoolball in WW1 and would be very interested to hear about your Grandfather’s connection with the game. Many thanks! Can you tell me if there are any hospital records of patients between 1917-1918? My grandfather, Frederick Charles Houghton, Rifle Brigade, was in hospital in Hove after getting shrapnel in both legs. Thanks.